Happy Beaujolais Nouveau Day! Every year on the third Thursday of November, French producers release bottles of Beaujolais Nouveau, a wine that is fermented for just a few weeks. Though it’s a fairly big deal in the US (just peek into your nearest wine store and you’ll probably see a big cardboard display), the country that celebrates it the most is Japan. Last year the country imported 7.9 million bottles of the flash-fermented wine. Compare that to America’s measly order of 1.8 million bottles and you’ll start to grasp how much Japan loves Beaujolais Nouveau. 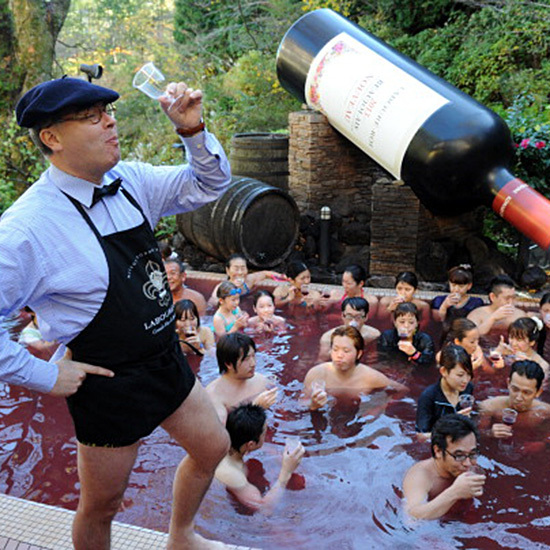 But if that number is not enough to convince you, maybe this is: There’s a bathhouse near Tokyo that offers a hot Beaujolais Nouveau bath. An annual offering from the Yunessun spa, the liquid in the giant outdoor bath (think small pool, rather than claw-foot tub) is, sadly, not all wine. It’s about 13,000 liters of water and 9 liters of Beaujolais Nouveau, which turns the bath a lovely magenta (purple dye does the rest). So don’t worry (or get excited about) getting drunk while you bathe. Still, it’s a pretty nice soak.